Forty years ago, when I was a somewhat younger fellow and DRE in Kalamazoo, Michigan, I found myself the only man at a table with seven women, during a diocesan conference on the role of women in the church. One of the women in our group, with obvious dislike for my long-winded observations, looked right at me and said: “Well isn’t that just what we need in a conference on women in the church: another pontificating phallus? Why can’t you let us women speak? Why can’t you really listen to what women are thinking and saying?” Some criticism stings…. I thought about my Kalamazoo pontificating experience, a few days ago, as I read about Cardinal Gerhard Müller’s ongoing criticism of the Leadership Conference of Women Religious. The CDF Prefect claims over and over that LCWR is promoting doctrinal errors, radical feminism, and heretical gnosticism. LCWR leadership continues to assert that the Cardinal Prefect doesn’t listen and is simply unable and unwilling to try to understand what they are saying. Last week L’Osservatore Romano — the voice of the Vatican — carried an interview with Cardinal Müller. “We are not misogynists,” he said. “We don’t want to gobble up a woman a day…” he quipped. A humorous remark? A serious statement of ecclesiastical management style? Or simply a way to avoid confronting the issues? In less than a month, we will witness (more or less depending on which news source one follows) the Synod on the Family. Great preparations. Numerous consultations around the world. Great hopes raised. This week we have been informed that over one hundred and seventy-five celibate male clerics will be entitled to vote. No women will be able to vote of course, although there will be some lay women and men as “observers.” The voice of the faithful? Vatican II’s sense of collegiality? At some point truly genuine dialogue has to begin. In so many ways today, women, around the world, continue to be gobbled up; and there is nothing comical about it. Patriarchy in a church environment — well in any environment — has a negative impact and creates an environment more susceptible to the abuse of women than one characterized by mutuality and shared leadership between men and women. The virtue of mutuality must replace subjugation. The virtue of harmony must replace man-over-woman power-struggles. Certainly in the church, men need women not as subordinates but as partners. It started that way, actually, in our Christian beginnings…. Mary of Magdala, for instance and not one of the “apostolic” guys, was charged with proclaiming that Jesus had been raised from the dead. No small proclamation. Early Christians were counter-cultural….and more much more inclusive and woman-friendly than later “fathers” of the church. The Vatican’s Congregation for the Doctrine of the Faith, however, has put the Leadership Conference of Women Religious under male hierarchical control. What happened to woman-friendly counter-cultural and inclusive Christian leadership? Sometimes our contemporary Catholicism becomes curiouser and curiouser. Ignorance is not bliss. And there can really be no excuse for ignorance among supposedly intelligent and well-educated people. Maybe a lot of us men — whether we wear neckties, Roman collars, or red skull caps — need to keep quiet and really listen before speaking so authoritatively. Patriarchal paternalism and misogyny are still very much alive in our church. They are not Christian virtues. Another great letter to the faithful. What a disappointme seems to await us in this Synod. Sadly I hold out no hope for the synod. I love that picture, by the way, and I applaud your willingness to self – criticize. Too bad our bishops don’t exhibit that virtue. I hope there will be some courageous bishops who take a positive contemporary stand like Bishop Bonny…….If this synod flops, I fear one can expect a major exodus from the church. 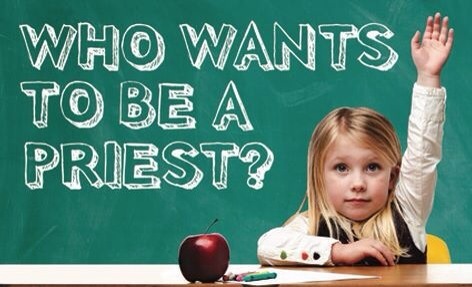 Who wants to be a priest? There was no necessity for Pope Francis to declare that “that door is closed” on the subject of women’s ordination. We have a precedent for re-examination of previous Papal edicts, in the establishment in 1963 of the pontifical commission on birth control. This was set up by Pope John XXIII in spite of the fact that Pius XI had unequivocally condemned artificial methods of birth control in 1930. The fact that Pope Paul VI lost his nerve when it came to implementing the recommendations of the commission should not stop Pope Francis from repeating Pope John’s initiative.